The City of Brussels has erected a statue of it's most famous singer Jacques Brel. It found its home on the "Place de la Vieille Halle aux Blés". His Statue is made at the request of the trade association on the square, which is already the home of the Jacques Brel Foundation. 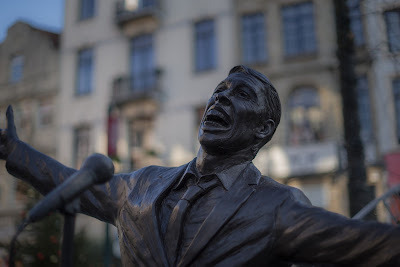 The bronze statue is made by artist Tom Frantzen and is titled L'Envol or "The Flight" It a shows a singing Brel behind his microphone with his arms wide open, something he always did at his very expressive life performances. The statue is placed on the corner of the triangular square and is oriented towards the descending Eikstraat, where another famous inhabitant of Brussels is located, Manneken Pis. "Jacques Brel seems to welcome you with open arms when you come from below", says artist Tom Frantzen". When you get close, it seems like you are attending a concert by him, because he is standing on a small elevation, and it looks as if Brel rises up into the air, which symbolizes the feeling of freedom he stood for and it gives the statue its dedicated name. You can find the statue at this address: Rue du Chêne, Eikstraat, Brussels.